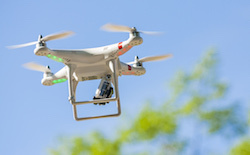 Drones/UAVs Austin Liability - More Drones! I read this article and thought it, in much more detail and by first hand account, described what I predicted would happen with this market. Recently, I wrote here about the expanding drone market. Anecdotally, the drones have become more popular because of their cost, and more known over the last year because of their presence making quality videos from GoPro cameras. Seth suggests that calling these things drones doesn't hurt in spurring up some excitement over the new products. Seth took it upon himself to test fly some of these new drones. He made it known that although he is a bright guy who generally understands technology, especially when a "quick start guide" is involved, he had no experience flying any remote controlled machine - just like many who will open up a new drone from under the tree this Christmas. Spoiling Seth's story, he crashed both drones pretty quickly. In one case, he could have easily, albeit accidentally, injured an unfortunate bystander. With the recent flurry of activity over potential FAA regulations relating to UAV use, Seth's experience would certainly be persuasive that perhaps these shouldn't be sold at Walmart, for example, or without a license, or maybe even without specific liability insurance. As he writes, "after my own traumatic drone crash, I'm... worried about recreational drone pilots who are acting like morons. And here, Schulman (a lawyer representing a drone interest group) and I disagree. He thinks existing laws are sufficient to handle any dicey drone eventualities. 'consumer devises pose hazards all the time,' he tells me. 'People are injured by flying baseballs. There are 150 fatal lawnmower accidents a year. We have personal injury laws and property damage laws to deal with this, and any injuries that result from drone use can be resolved within existing legal frameworks.'"